AluaSun Torrenova is an award-winning 4-star hotel in Palmanova. It is located right in front of the Palmanova Beach in Palma Nova Majorca. The all-inclusive hotel is an ideal destination for families, groups, couples and individuals to spend a relaxing and energizing holiday. The AluaSun Torrenova Hotel offers a very entertaining vacation with all types of facilities and services, which enables the guests to enjoy their holidays at Palmanova Beach. This family-friendly hotel has complete range of facilities that include an all-inclusive adult-only outdoor swimming pool, children’s splash pool, entertainment program, outdoor sports, bars, restaurants and much more. The hotel is situated in Palmonava’s exclusive area. It is the best choice for those who are looking for the best facilities at a decent price. This hotel is ideal for couples, families and children. 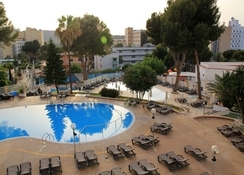 The AluaSun Torrenova Hotel is located near the beach of Palma Nova in Majorca. The hotel is about 29 km away from Palma de Mallorca Airport. The Palma nova beach is around 450 metres away from the property. There are numerous shops and bars in the surrounding area and within walking distance from the hotel such as BCM shop (800 metres), Carrer Cala Blanca (500 metres), etc. And a few distant markets such as Inca (45 km), Airport Market (28 km), etc. Other places of interest include Western Park (4 km), Port Adriano (8 km), Cathedral de Mallorca (18 km), Puerto Portals Marina (7 km), etc. AluaSun Torrenova offers 254 elegantly dressed guestrooms divided into standard double and superior ocean view rooms. Fitted with modern conveniences such as television, telephone, refrigerator, minibar, air-conditioning, hairdryer, etc., all rooms have double or twin beds and terrace with magnificent views. Soothing, soft-coloured upholsteries and dark wood furniture gives a luxurious and rich look to all the rooms. A furnished balcony overlooking the beautiful Palma Bay is a perfect place to spend a relaxing and leisure holiday with friends, family or partner. 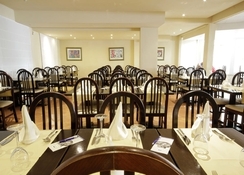 The standard double rooms can accommodate two guests, while superior double rooms can accommodate two to three guests max. A few amenities are payable locally, such as internet access, in-room safe, etc. Superior rooms feature special amenities like personal care and hygiene kit in the en-suite or priority booking at the restaurant, airport transfer, etc. 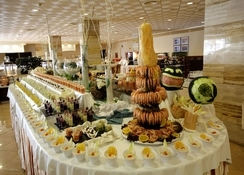 This 4-star hotel in Palmanova serves food in both a la carte and buffet styles with a variety of dishes. 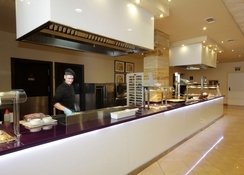 Local, Mediterranean and international flavours are served for breakfast, lunch and dinner in the buffet restaurant; the a la carte restaurant is an Italian specialty. 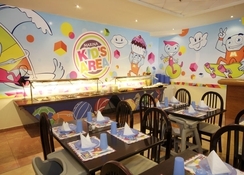 The variety of food items range from main, full course meal to pizza, pasta, salads and desserts such as rich, creamy cakes and pastries, ice cream, etc. Take your pick from an array of beverages both alcoholic and non-alcoholic, including coffee, tea, cocktail, fresh juices, soft drinks, chilled beer, martinis, etc. In addition to this, there are a lot of bars and restaurants available in the vicinity, where you can find a myriad of cuisines. 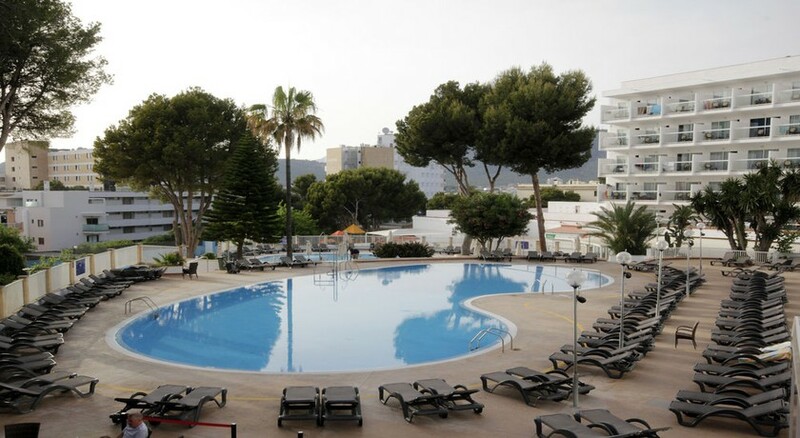 The recreational activities at AluaSun Torrenova include two outdoor swimming pools and children’s pool, sun terrace with sun loungers and parasols, volleyball, tennis, aerobics, water polo, darts, table tennis, billiards, kids’ club, playgrounds and night entertainment by the hotel animation team. The beach offers loads of water sports like snorkelling, scuba diving, kayaking, windsurfing etc. You can also rent a bike from the local shops and explore the nearby trails. Place was ok, certain things a bit thread bare and tired looking though.